Many schools have found creative ways to get a recycling program started at their schools. Unfortunately, the Fulton County Public School System Administration did not make recycling a part of the waste contract. Therefore, each school has to develop their own program if they wish to recycle. In most schools, parent volunteers are involved with recycling programs and have set up "green teams", or "eco clubs" that work with groups of students before or after school to recycle. This can be as simple as using copier paper boxes decorated by classes to collect paper. If your budget provides, you can purchase the 18 gallon plastic recycling bins from an area office supply, home supply store, or online. Sometimes you can even get a waste hauler to donate them. Some schools will tackle one grade level by providing bins in each classroom, including the copier rooms, and roll the program out on a small scale before deciding to do the entire school. Once the paper is collected in a classroom, the green team picks up the paper weekly in either rolling carts provided by a trash/recycling hauler, or in bags that are put in a paper bin outside the school - Southeast Paper can provide these. Shopping carts or wagons can make the hauling easier. Check out the companies below for help with providing some of the materials and services needed to get started. Most companies now provide "Single Stream Recycling", which means that you can combine items such as paper, cardboard, aluminum cans, plastic, and glass together in one bin. It is later sorted at the facility. This can enable schools to recycle thousands of pounds per year. Before choosing your waste hauler, check to make sure they provide Single Stream Recycling if you are interested. Guide to Recycling for Georgia Schools by Keep Georgia Beautiful. For a hard copy contact Sarah Visser, (404) 679­4853. Having trouble getting your environmental club to take hold of the recycling initiative at your school? Advanced Disposal has a school recycling program that includes carts for single stream recycling and weekly pick up for a small monthly charge. To talk about the details, please call Justin Lynn, 678-481-9177. Advanced Disposal is a trash and recycling hauler and owns a recycling sorting facility in South Forsyth County. They have been providing recycling service for many of our North Fulton schools for years. For schools located within Roswell, Roswell public and private schools can get more information by contacting Ms. Trevor Williams. 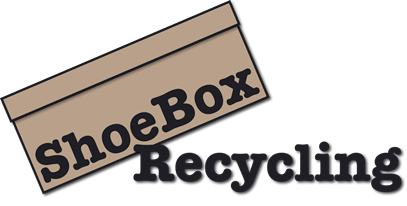 Shoe Box Recycling offers Shoe Recycling That PAYS Your School! Our company has been doing textile and shoe recycling for over 12 years and we are working hard to ensure that everyone finds a way to recycle their old shoes. Our program is simple. We provide boxes, pay for shipping and provide funding to you from the collection of shoes. We think this video says a lot of what we do and how we inspire shoe recycling. RecycleBowl is a fun, fair and friendly competition among grade schools in the US. The competition awards cash prizes and bragging rights plus providing teaching moments, and engaging students in taking action in recycling. Public, private and charter schools are eligible; The competition includes recycling bottles, cans and paper and lasts for 4 weeks. Recycle-Bowl is a free competition and benchmarking tool for K-12 school recycling programs to promote waste reduction activities. Be sure to sign up by Wednesday, October 15, 2014! Recycle-Bowl begins Monday, October 20, 2014 and runs through Saturday, November 15, 2014. School Division Champions: A winner from each U.S. state and the District of Columbia will receive national recognition and bragging rights based on the most recycled material per person per school. The National Title: America’s Top Recycling School! A national champion will be chosen from the top state winners to receive an additional prize. Involve your community. To keep things fair, if your school collects recyclable material from around the community or parents homes, this will be treated as a separate division. Schools will track the amount of material recovered per person and will compete with other schools on a national level.The Community Division offers another opportunity to receive national recognition as a Division Champion. The details can be found at this website.